Spain – every day's a holiday! So how did the next-best-thing to the Apocalypse come to be celebrated on the feast day of Saint Joseph, adoptive father of Jesus? Well, though St. Joseph’s Day is celebrated as Father’s Day across Italy, Spain, and Portugal, the Valencians chose to celebrate another calling of Joseph. Joseph is also the patron saint of carpenters, an occupation that made up a good segment of the urban population in the Middle Ages. According to “Valencia en la epoca de los Corrogidores“, each Autumn, carpenters carved special planks of wood to serve as candle holders, either free-standing or hanging on the wall. Called estai, parot, or pelmodo, these medieval lamps provided light for carpenters to work by during the long winter nights. Apparently the Valencian carpenters weren’t big fans of recycling. Each year on St. Joseph’s Day they would celebrate both their patron saint and the coming of spring by burning these special wooden candle holders along with any leftover wood. The pagan tradition of burning effigies on or near the spring equinox had long been a ritual in pre-Christian Europe. The Valencia carpenters had the idea of killing two birds with one stone. The dressed up the wooden lamps as unpopular local authorities—perhaps an unscrupulous sheriff or maniacal mayor—before burning them. After five days of festivals and celebration these miraculous, almost supernatural creations go up in smoke, just as in days of yore. Called “La Crema”, the bonfires take place on the evening of Saint Joseph’s Day, March 19, and for one long night the conflagration makes Valencia look like —well, let’s just say Nero’s Rome couldn’t hold a candle. The Spanish Christmas Lottery isn’t officially a holiday, but it’s an inseparable part of the holiday season in Spain, dating back to 1812. Each December 22, the entire nation waits on the edge of their seats for the winning numbers to be announced on TV, in a program that takes several hours. 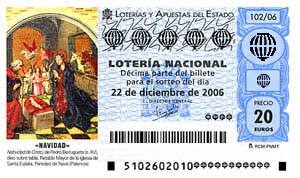 It’s estimated that 98% of Spanish residents take part in this lottery. It’s the largest lottery in the world in terms of payout. The first prize, aka El Gordo (“the fat one”), is 3 million Euros. May not sound like much, but the 3 million isn’t split up. Rather, there are close to 200 winning tickets, and each winner gets 3 million Euros! When you take into account that’s just one of the 1770+ prizes, the pot is well over 2 billion Euros. Second prize is 1 million Euros. Third prize is 500,000 Euros. The big winner in the Christmas lottery is the same each year: the Spanish government pockets 30% of the gross, not to mention any unclaimed prizes. Close to a billion Euros! Anyway, the point is, Christmas is a special time. A time of giving and of gambling. And if you did happen to win the Spanish Christmas Lottery this year, don’t forget “Every Day’s a Holiday” on your Christmas list! On September 8, the Catholic world celebrates the birth of the Virgin Mary. 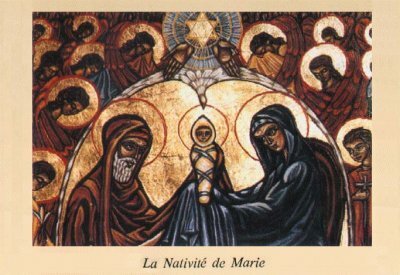 Little is know of Mary’s birth from the Bible. The Gospel of James (which didn’t make the final cut) list her folks as Joachim and Anne (Hannah). The couple was childless until they were visited by an angel who informed them a child was forthcoming. Anne promised the child would be brought up to serve the Lord. For two-thousand years, the Virgin Mary has been the symbol of feminine spirituality in Christian culture. While Eve was unfairly vilified as the bringer of original sin throughout the Middle Ages, Mary represented the opposite, the ultimate purity and the the bringer of God. Pope John Paul ll in his 2000 millennium message elevates the status of both Eve and Mary. He describes Eve as the original symbol of Humanity, the mother who gave birth to Cain and Abel, and Mary, who gave birth to Jesus, as a symbol of the New Humanity; one in which All Humanity is One in Spirit with God. This statement changes the context which the Christian doctrine has relegated to women; that the Spirit of God resides equally in male and female. Visions of the Virgin Mary have been spotted by worshippers throughout the Christian world. One of the most famous of these was witnessed initially by three children in Fatima, Portugal in 1917. On the Nativity of the Virgin Mary, many Mediterranean and Latin-American villages carry her statue from local churches through the streets. 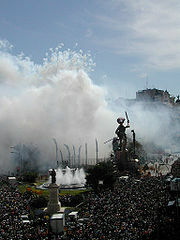 Local Spanish processions are known as Virgin de la Pena, Virgin de la Fuesanta, and Virgin de la Cinta. 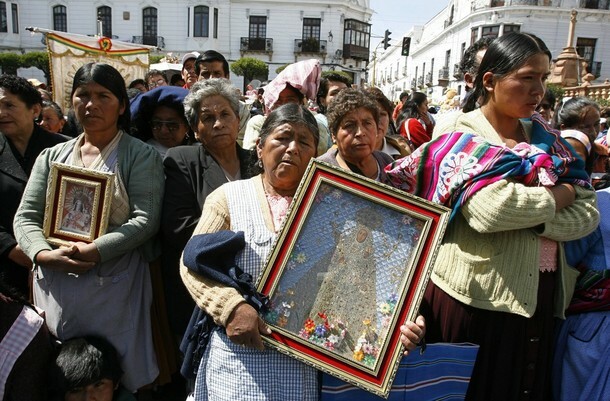 Peru has the Virgin of Cocharcas, and in Bolivia it’s the Virgin of Guadalupe. And it may not be Madonna (Madonna Louise “Like A Virgin” Ciccone)’s birthday, but singer-songwriter Aimee Mann turns 51 today…and rumor has it she’s still a Virginian. 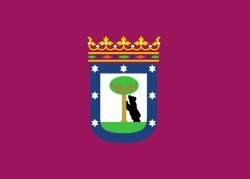 364 days out of the year, Buñol is a quiet, ordinary Spanish town country nestled in the foothills of the Valencia mountains about 40 kilometers from the Mediterranean coast; its population is just shy of 10,000. But if you happen to visit Buñol on the last Wednesday of August, don’t wear your finest. 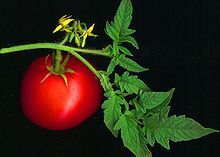 You will notice that the population has tripled in size, the bulk of these tens of thousands have amassed along a few narrow streets, and they’re all engaged in a peculiar activity: throwing tomatoes. Over a hundred TONS of tomatoes. During a Gigantes y Cabezudos festival (the kind with the really big heads as featured in Borat) some rowdy spectators attempted to become participants, knocking over a big-head-carrying procession member in the process. A scuffled ensued among the hot-tempered youths. Now, the people of Buñol had always enjoyed throwing things at each other. And fortunately for posterity, a truck or cartload of tomatoes had overturned just prior this auspicious occasion, providing the feuding parties with the perfect ammunition. The following year authorities hoped to stem a repeat of the disaster, but the veterans of the previous year had some unfinished business to attend to. The activity was first sanctioned by Town Hall in 1950. It was permitted and prohibited intermittently over the next few years. It got out of hand in 1956, townspeople got hurt, and it was canceled the following year. Some folks held a Tomatina Funeral instead. The festival was brought back by popular demand in 1959–but with regulations*–and they’ve been throwing tomatoes ever since. Yes, La Tomatina started out as a Buñol style gang war. Perhaps in the States, if we armed our inner-city youths with tomatoes (in LA, avocados) we would attract tourists instead of violence. As it is, in Buñol tens of thousands of tourists flock to La Tomatina each year. The festivities begin with the scaling of the “soap pole”. A ham is stuck atop a tall greased pole, and the tomato throwing can’t begin until a brave crowd member retrieves it. *If you go, it’s considered proper Tomatina etiquette to squish your tomato before hurling it. Don’t bring bottles or anything that could cause injury, and be careful not to rip other people’s clothes. And it doesn’t matter if you’re wearing red or not. You will be. WARNING: NOT FOR THE TOMATO-PHOBIC! 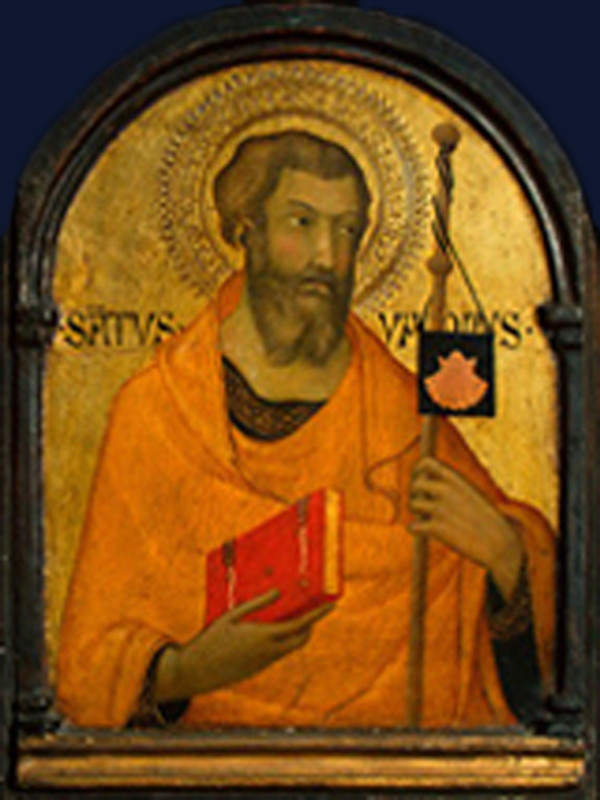 July 25th is the feast day of St. James. James and his brother John, sons of Zebedee, were two of Jesus’s twelve Apostles. After Jesus’s crucifixion, James took the Gospel westward to unchartered territories—Iberia—and never looked back. Oh wait, he did look back, unfortunately. After receiving a vision of the Virgin Mary, James returned to Judea where he was beheaded by King Herod Agrippa I in 44 AD. But that’s not the end of James’s story. No, James’s hagiographers tells how James’s followers risked their lives to bring James’s body back to Iberia. They witnessed several miracles on the way, eventually laying his relics to rest at the edge of the western world: Santiago de Compostela in Northern Spain. Santiago de Compostela is the destination for thousands of pilgrims who make the journey to St. James’s resting place each year. The route is known as Camino de Santiago, or the Way of Saint James. The most commonly traveled route is the Camino Frances. It starts somewhere north of the border in the French Pyrenees near St Jean Pied de Port. The trail winds 780 kilometers westward across Northern Spain to Santiago de Compostela, though many pilgrims continue a little further west to Cape Finisterre on the Atlantic. Finisterre comes from the Latin for “land’s end”. The cape was once believed to be the end of the world. On foot the pilgrimage takes about a month of walking. Peripatetic veterans recommend walking from 6am to 1pm. There are plenty of towns to stop in along the way, and such a schedule figures in nicely with the Spanish siesta, falling around 2pm each day. The numbers of pilgrims have skyrocketed since the 1980s, when only a few thousand travelers would make the journey each year. These days that number is in the hundreds of thousands. Religious devotion varies among trekkers. 14 people have been killed in the San Fermin Running of the Bulls since 1924, when they began counting. To give you an idea of the scope of the mayhem, that’s almost equal to the number of people killed by vending machines in the U.S. since 2001. Running with the Bulls (aka the Encierro) has been a Pamplona tradition for centuries. Local organizers remind tourists to take safety precautions and warn them of the potential for serious injury. The warnings are often shrugged off, but last year two California brothers got the point in the end. Protesters aren’t so concerned with injuries to humans, but with cruelty to animals. 40,000 bulls are killed by the bullfighting industry each year in Europe. 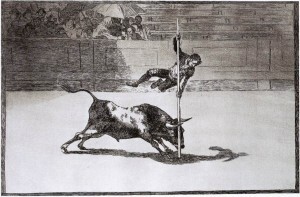 These and other facts about bullfighting are ‘exposed’ during PETA’s Running of the Nudes, which coincides with the festival each year. Who knows which Run the good Saint Fermin would prefer? 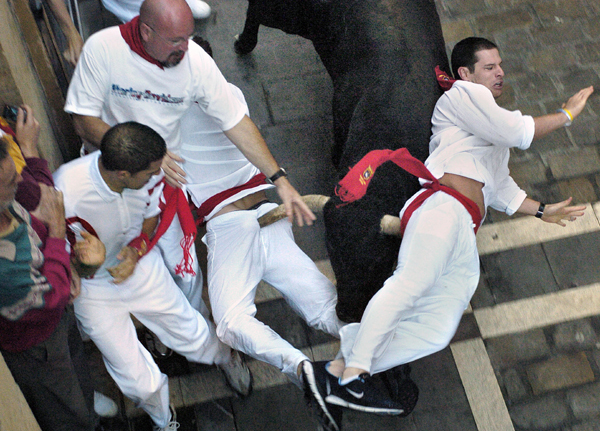 Q: So who is this Saint Fermin anyway, and what does he have to do with bulls? A: St. Fermin was the son of a Roman senator in Pamplona. He converted to Christianity, was named a Bishop in Amiens, returned to Pamplona to lead his flock, and was martyred back in Amiens in 303 AD. He was actually beheaded, not slaughtered by bulls. And in September, not July. 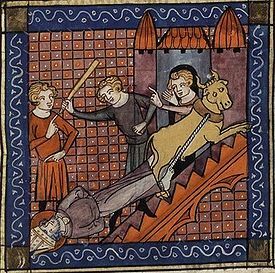 It was his predecessor Bishop Saturninus of Toulouse who had the honor of being tied to a bull by his legs and dragged to his death. The two saints’ martyrdoms are sometimes confused because of Fermin’s association with the Encierro. The tradition of honoring St. Fermin in Pamplona dates back to 1186, though the liturgical festival was originally in October. 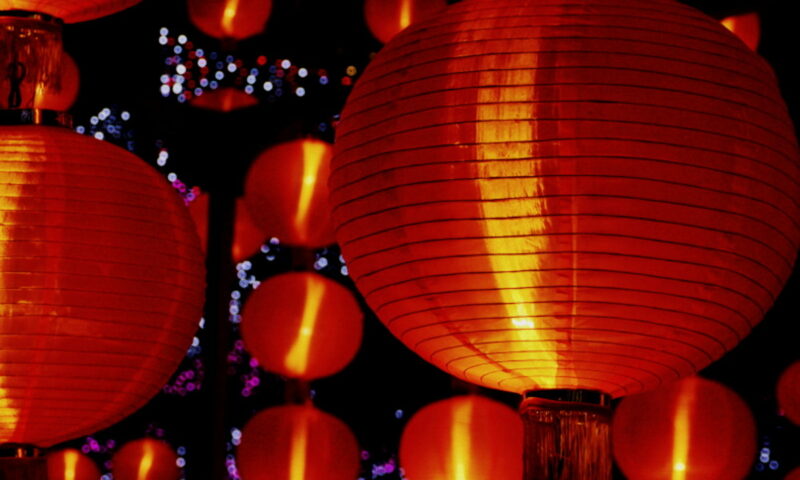 It was moved to July 7 in 1591 to coincide with the summer market fairs and bull ceremonies. So if you’re running with the bulls this week, stretch beforehand, wear good shoes, and be careful where you slip. Just when Madrid sobers up from back-to-back celebrations of Labor Day and Dos de Mayo, it pulls out all the stops for the week-long celebration of San Isidro. San Isidro (1070-1130) is Madrid’s patron saint, whose feast day falls on May 15. 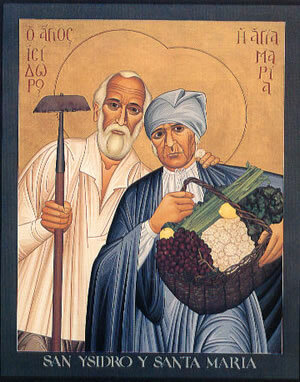 The couple lived in poverty for most of their lives, but they were known for their generosity, giving more to the poor than they kept for themselves. Stories of Isidro’s miracles, like the materialization of food and water for the hungry, are reminiscent of Jesus feeding the masses with a single loaf of bread. According to legend, one day Isidro’s scythe struck the earth, and a spring burst forth with enough water to sustain the whole city. 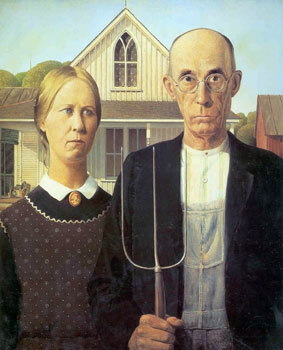 In the 900 years since Isidro and Maria walked the earth, farmers have called on them for relief in times of drought. The holiday also marks the beginning of bullfighting season. Spanish bullfighting traces its roots back to Mithras, imported from the Middle East either through Rome or North Africa. If you’re with PETA, and bullfighting doesn’t do it for you, concerts and dancing fill the streets the whole week. 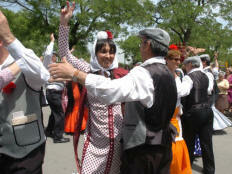 Parks are converted into open-air verbenas, where celebrants wear traditional attire: chulos and majos for the guys, chulapas and majas for the ladies. Chulo is a derogatory term sometimes applied by other Spaniards to the inhabitants of Madrid. It means arrogant. But the Madrilenos take it in stride. Dressed in chulo and chulapa costumes, performers live up to their name in a stylized dance of exaggerated arrogance. 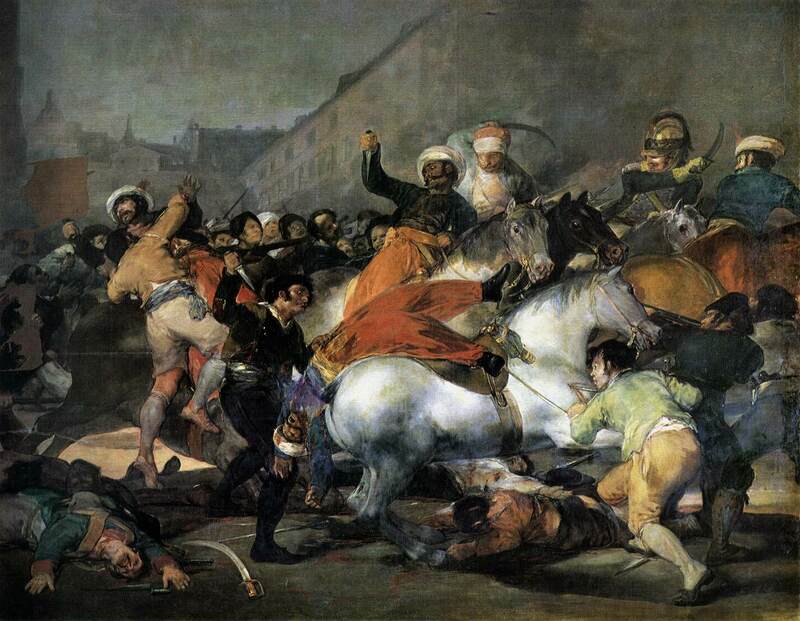 Goya's "Dos de Mayo, 1808"
Guerrilla warfare. To any kid who’s failed a spelling bee because of one of the most misspelled words in the English language, you’re in good company. Before learning the proper spelling, I too assumed it was war that took place deep in the African jungle. The term ‘guerrilla warfare’ is used to describe tactics adopted by small militias and individual fighters, often in Third World countries, to engage larger occupying forces in small skirmishes rather than large battles. It comes from the Spanish word “guerra”, meaning war. And though guerrilla warfare has been a key component in dozens of South American conflicts over the last century, the term guerrilla hails from the other side of the Atlantic, from a conflict that began 200 years ago in Madrid. In 1807 Napoleon signed an alliance treaty with Spain, which effectively split the country of Portugal between Spain and France. Portugal was taken without hardly firing a shot. The following February, however, Napoleon turned on his Spanish ally. (A history lesson not lost on Hitler.) Napoleon didn’t even need to invade Spain; for the country was already inundated with French troops who had crossed the border under the pretense of invading Portugal. Meanwhile, Spain’s troops were scattered from Denmark to Portugal, many of them on loan to Napoleon. Spain was, militarily speaking, screwed. Add to the plot a cast of wacky feuding royals (In March, Prince Ferdinand overthrew his father King Charles IV with the support of a discontented Spanish public) and you have the makings of a full-on Peninsular War. Come Leap Day, French troops entered Barcelona–by pretending to be a convoy of wounded–(and you wonder why the Spanish don’t trust the French? )–and took the city. 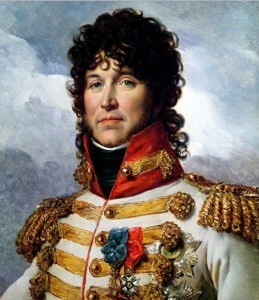 The French general Murat entered Madrid the following month. About this time the Madrilenos began thinking maybe their beef was not with either of their kings, but with the French. Napoleon ordered the remainder of the Spanish royal family, including Charles’ 25 year-old daughter Maria Louisa, her uncle Don Antonio, and her little brother, the preteen Francisco de Paula, to join them in French Bayonne for a little more ‘mediation’. An armed riot broke out, and Murat’s forces fired on the crowd. Soon, street fighting erupted through Madrid, focusing around the palace and the Puerta del Sol. For a short time the Madrilenos pushed back the surprised French guards, but Murat sent in reinforcements, and quashed the outgunned Spanish rebels by nightfall. 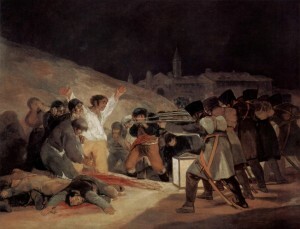 On May 3, hundreds of Spanish rebels were executed by firing squad. News of the mass killings spread throughout Spain and the Spanish resistance was born. Guerrillas, referring to ‘little wars’ and the soldiers who fought them, changed the course of the Napoleonic era, not by defeating the French in large, decisive battles, but by engaging them in a steady stream of small attacks over thousands of square miles. In February Napoleon had bragged he could take Spain with 12,000 men. He did take Spain, but he had to divert 160,000 of his troops from other battles to do it. Napoleon called the guerrillas his ‘Spanish ulcer’. In 1813 British, Portuguese, and Spanish forces expelled French troops from the Iberian peninsula for good.